Stunning 960P FootagePremium cameras equipped with high performance lens bring close-up detail in all they capture. 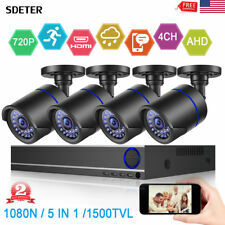 Seeing is believe with this 960P video surveillance system and get 24/7 reliable safeguard.Enjoy Wireless FreedomNo ugly cords, no complicated wirings, you’ll find installation is a total breeze thanks to the Wi-Fi access feature. This real plug-and-play system offers you peace of mind in home security.Free App for Mobile AccessWith easy-to-use app and software designed for mobile access, you can see whatever the cameras see even you’re thousands of miles away. Security is in palm of your hand.Be Always In The KnowYou can choose between whole screen motion detection and custom region motion detection. When unexpected movement is detected, an instant alarming email will be sent to you.Around-the-Clock ProtectionWorried about someone nosing around in the backyard or a burglar breaking into your house at night? Cameras with up to 100ft/30m night vision will capture them all and leave nothing to the imagination.HDMI & VGA OutputsWatch the beautiful color and smooth on-screen movements on your TV, monitor or computer. The HDMI and VGA ports provide you flexible output options for easier video monitoring.Save Storage with H.264The standard H.264 compression helps save your storage by compressing videos into a smaller size using smarter coding. Meanwhile, transmission and bandwidth efficiency are also enhanced.Indoor& Outdoor CamerasWe engineer our cameras with IP66 weatherproof rating to make it durable enough to withstand extreme weather conditions. Let it be heavy rain or furious snow, they’ll never let you down.Stable Point To Point ConnectionThe IP cameras are stably connected to the NVR in their own network by factory setting. You don’t have to pair them again in installation. The the distinct connection separates them from other devices on your network and frees the system from interference. Set One Camera As A RepeaterYou ‘re allowed to set one(or more) of the WIFI camera which is close to the NVR as a repeater. It acts like a relay that connects the far away (or weak signal )cameras with the NVR in order to ensure the transmission stability between them. It is especially used in cross floor transmission or indoor-to-outdoor transmission.Use The Included Extension AntennaAn extra extension WIFI antenna is added to the wireless NVR kit. And this antenna can be applied to the camera of which NVR receives weak signals due to the far distance or physical obstacle(as as walls) and strength WIFI transmission between them.Stick it To Any SurfaceThis 3m/9.8ft WIFI extension antenna is built with magnetic base and equipped with a 3M adhesive tape. You can stick it to any metal surface or just attach it on walls or ceilings using the included 3M adhesive tape.Stable Point To Point ConnectionThe IP cameras are stably connected to the NVR in their own network by factory setting. You don’t have to pair them again in installation. The the distinct connection separates them from other devices on your network and frees the system from interference. 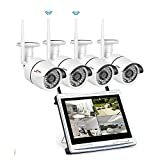 ANNKE 960P 4CH Wireless Surveillence System DVR 1.3MP Cameras Security Kit With Super Night Vision With No Hard Drive DiskThe power of wifi cameras is supplied by cable and plug, the cable is only 1.5meter. So if you want to put them the corner need there is a socket. The cameras are well made with 1280?720P resolution. You can easily find out the details in the corners without having your eyes strained or your back leaned in.Apart from the TVI format, this powerful DVR supports CVI/AHD/CVBS format and extra IP camera input, thus you can hook it with your old cameras or just connect to brand new cameras it would work just fine with its stunning compatibility.Understood different configurations for different devices and to better its compatibility, this DVR has both HDMI and VGA output and by working with 1080P cameras the max 1080N video output is guaranteed.The cameras have 24pcs robust Infrared LED that automatically switch on to give a distinguish night vision of max 66ft for 24/7 continuously security and nighttime surveillance enhancement.This 32-channel DVR works with up to 32 surveillance cameras, and it uses advanced H.264 compression that the storage usage is effectively extended whilst the video quality remains 720P.To separate local recording from remote viewing, we employ the remarkable dual-stream design, which guaranteed you to have smooth real-time video and free from interference.The cameras equip with the most sensitive motion detection so that you can expect email alerts simultaneously when there has suspicious activity going on.This surveillance system is able to be accessed and controlled remotely via PCs and mobile devices. You can review or watch live videos from a far conveniently.Continuously and simultaneously record from the cameras feed at the max 720P resolution typically requires a huge storage space. This system provides you max 12TB storage to safely store the footage. Engineered specifically for surveillance security systems. 2TB Hard Disk Drive for CCTV Camera System. Tuned for write-intensive, low bit-rate, high stream-count applications typical to most surveillance applications..
Prioritized write-operations for maximized surveillance performance.. Supports up to 180 TB/yr. workload rate.. This is not PC HDD, it is Professional 1TB Surveillance Hard Disk FOR ANNKE or SANNCE SECURITY SYSTEM. This is not PC HDD, it is Professional 2TB Surveillance Hard Disk FOR ANNKE or SANNCE SECURITY SYSTEM. 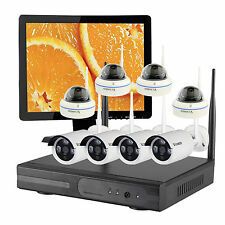 The wireless home security system releases your mind: 4ch 1080p Security DVR/ NVR System built in 12inch LCD screen kit release you from selecting corresponding monitors (not a touch screen). 2 USB ports offer an extra option to mouse connect, USB drive to back up video or upgrade system. You can also back up, playback and view cameras on smart phone anywhere anytime when wifi or 2G/3G/4G data is available. 【Video for installation and Setting:】https://youtu.be/EQxeK9grNOA. Plug & Play, Set up without professional skills needed: Wireless CCTV Surveillance system use auto-pair technology, you will see real-time 1080P HD video on monitor immediately after you plug all those bullet cameras to nearby power outlets. Hard Drive Disk is not included. You can view the video on the 12" display, but can not save the recording video. Requires 3.5inch SATA internal port HDD, max capacity can be 4TB..
Wireless connection: No video cables between cameras and DVR/ NVR Recorder, this wireless security surveillance system offers a free of wiring hassle solution to protect your property. 【Note】The network IP system has to plug into power socket for power supply. There is no internet required if you only view local video on your monitor. But if you want to remote view cameras on phone, please hard wire the DVR/ NVR Recorder to home router with provided 3ft Ethernet Cable.. Always keep an eye on your home: you can view flawlessly stream video not only on monitor, but also on free phone app or PC Client software. Free APPs (Eseecloud, Eseenet, IP PRO) are all available on Google player or APP store. When monition is detected, an instantly email alert or App notification will be sent to you. Motion detection scheduling recording helps us save HDD space but never miss any important events..
Night vision and waterproof network camera: 36PCS HD IR leds offer extraordinary clear night vision distance upon to 85ft. Cameras have waterproof IP66 metal housing which can withstand any severe weather, you can install the camera outside to protect your indoor outdoor home surveillance. Certificate adapters for home camera system, 2 years warranty and lifetime tech-support for ANRAN. 【Email:[email protected]】【Skype:anran-cctv】.